Early facet arthritis in the lumbar spine needs to be taken seriously. Early facet arthritis in the lumbar spine will often narrow the foramen through which the femoral and sciatic nerve roots pass on their way to the leg. An important part of the history is whether the patient has more LBP or lower extremity pain. The femoral nerve leaves the mid lumbar spine, passes through the pelvis and emerges via the groin on its way to the front of the thigh and the inner lower leg. Any weakness may affect the quadriceps muscle. The sciatic fibres escapes from lower in the back and emerge from the buttock via a space between two muscles before passing down the back of the thigh and lower leg to the foot. Any paresis as it's called may primarily affect lifting the big toe, or raising the heel. For more information about these nerves, use the search function in the navigation bar. Joints need to move otherwise the hyaline cartilage lining the bones becomes starved of nutrients and oxygen; degenerative changes soon start. The trick is to keep them mobile, primarily with specific lower back exercises, but also perhaps with chiropractic manipulation if there are fixations; more about that later. 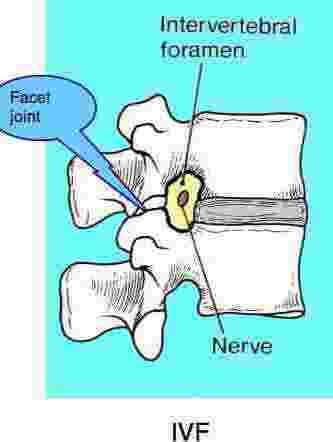 The foramen is bounded anteriorally by the disc and posteriorly by the facet joints. Both can cause severe nerve pain. Early facet arthritis often leads eventually to difficult to manage nerve pain in the leg. The scenario is often complicated by trauma such as a fall on the buttocks or lower back in which the facets are forcibly jammed against each other, damaging the cartilage that lines the joint. Other factors such as a short leg, or a childhood stress fracture as occurred in the case below, also contribute to the degenerative joint disease that plagues so many of us. An insert in the shoe can correct for a leg length deficiency, but nothing other than good muscle tone and care with lifting can counter the effect of the stress fracture through the pars interarticularis; fortunately in this case it was on one side only so there was no forward slippage. That's known as a spondylolysthesis. If the early facet arthritis is not correctly managed then the orientation of the joint gradually changes allowing for a forward slip of the vertebra above. These progressive degenerative changes cause facet enlargement and ultimately the whole canal becomes narrowed; the condition is called spinal stenosis. The secret is prevention; not allowing that early facet arthritis to progress to the full blown chronic nerve pain. That means exercise and an acceptance that lifting of grand pianos and even vacuuming sometimes has to be avoided. Many people have difficulties with prolonged sitting. Notice that the so called scotty dog above has a collar; that's the stress fracture through the pars interarticularis. 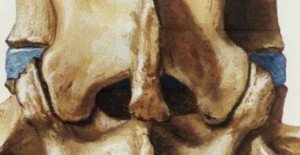 It's a narrow isthmus of bone between the superior and inferior facets. The following case file illustrates how early facet arthritis due to a stress fracture known as a pars defect resulted in advanced disc deterioration and chronic lower back pain. A 69 year old woman consulted me five weeks ago with right lower back pain radiating to the lateral thigh. She has had a strong back most of her life but about ten years ago began to experience episodes of LBP. They responded to medication, but the latest bout of pain which started some six month previously just continued to worsen. Every morning she was wakened with fierce pain in the lower back, but during the day it was reasonable. Turning in bed was difficult as was prolonged sitting and cycling uphill. Walking relieved her difficulties. When she was twenty one she had severe trauma, falling off a horse and fracturing her skull. Lower back and leg pain needs to be carefully evaluated; in the absence of sciatic and femoral stretch tests we have to conclude, as in this case, that this is not a true pinched nerve; however early facet arthritis can produce a noxious soup of chemicals. These can irritate it perhaps, but more likely referred pain from another structure, often the hip or sacroiliac joint. 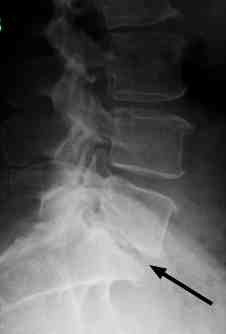 Significant disc degeneration is clearly visible. Recent x-rays of her lower back revealed an old stress fracture though the pars at L5 (black arrow) and facet arthritis (red arrow). On examination, forward bending immediately provoked lower back pain, but extension and lateral flexion were reasonably good. Sciatic stretch tests were normal and she was neurologically intact. L5 was extremely tender on deep palpation. The right sacroiliac joint and L5 were only mildly fixated. Three right sacroiliac joint orthopaedic tests were strongly positive. An accurate diagnosis was difficult. Despite radiating leg pain, the sciatic stretch tests were negative. Extension and lateral flexion were only mildly painful, making a diagnosis of a facet syndrome dubious. 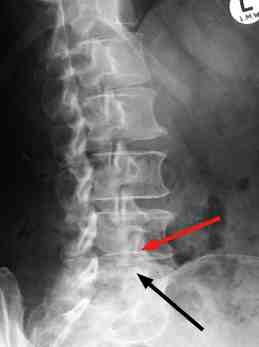 She had no strong signs of an injury to the disc, and by default a diagnosis of sacroiliac syndrome was made. But what really helped her was gentle side posture drop technique on L5. 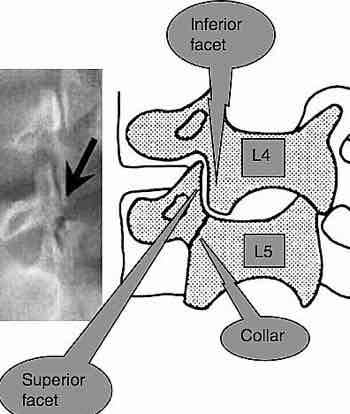 All in all, the L5/S1 disc, the facet joints and the sacroiliac joints are intimately involved and sometimes it's difficult making a precise diagnosis. She responded extremely well considering that she has had six months of pain waking her every morning. Treatment consisted of prone drops on the sacroiliac joints using the Derefield protocol, side posture adjustment of L5 whilst lying on her right side and soft tissue therapy down the side of her leg. An intensive exercise programme based on that found in the navigation bar on your right was mandatory. After five treatments she reported having 90% less pain and she had been on a 15 mile cycle with no pain. Prolonged sitting at her computer remains problematic. Her next consultation will be in three weeks times. 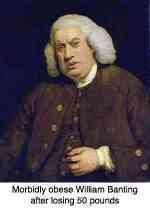 Thereafter I anticipate that an occasional, but regular treatment will be necessary; perhaps every six weeks. Here's an interesting question. Why didn't her early facet arthritis not progress with advanced degenerative change? Was it because three times a week she cycles fifteen odd miles? Was it perhaps because she absolutely adores salmon, rich in omega-3 oil? Or, something quite unknown? In any event, this lady has been doing something right. I wonder how many women of sixty nine could cycle fifteen miles? Go from Early Facet Arthritis to Chiropractic Help home page. Return to Lower Back Pain home page.